First and only opportunity at a payback game for VCU this year and it’s a big one as the Rams welcome the Davidson Wildcats to the Stu after previously defeating Will Wade and Co. 69-63 earlier this season. A win avenges one of the Rams uglier performances of the season while keeping VCU atop the Atlantic 10 standings as we head down the home stretch. A loss however would give the Wildcats their first A-10 sweep of the Rams while pushing VCU back into a crowded pack of chase teams hoping for a top-four seed headed into this year’s Atlantic 10 tournament. Big game today. Mo Alie-Cox averaged 16.3 points in VCU’s three wins over Davidson last season but was held to just 11 on 5-11 shooting against the Cats in an early A-10 loss. Despite Davidson’s early A-10 win over the Rams, the Cats find themselves in an unfamiliar position, sitting just below the top-half A-10 line at 5-6 in conference play. Oddly enough, VCU is Davidson’s only win over a top half team with two of their six losses coming to bottom half teams as well (Fordham and GW). Davidson has lost their last two, both at home, and now must play in front of one of the toughest road environments when traveling to the Siegel Center today. The Cats however have won their last two road games, both by at least 15 points. Davidson in many ways has been similar to VCU in that they have struggled to hit threes this season but has finished a high percentage of their shots. The key difference however is Davidson is taking a ton of threes despite their inaccuracies, taking 47.2% of their shots beyond the three-point line. In short, they are the definition of a “live by the three, die by the three” team. And that extends to their defense as well. Bob McKillop has his first top-100 defense since 2009, a defense that has defended the paint very well while often struggling to defend the three-point line. Lucky for them, that lines up nicely with how this year’s VCU team gets most of its points, as demonstrated in their earlier win against the Rams, holding VCU to 41.7% inside the arc while watching VCU go just 3-17 (17.6%) from deep. Davidson is led by the dynamic duo of Peyton Aldridge (21.1 ppg) and Jack Gibbs (20.9), a pair of experienced players that basically beat VCU by themselves, combining for 54 of Davidson’s 69 points in the Wildcat win. Davidson is 3-6 when Gibbs has been held to under 20 points this season, 5-2 when it’s Aldridge under 20, so clearly, the Rams’ ability to contain the all-conference senior will be of utmost importance today. 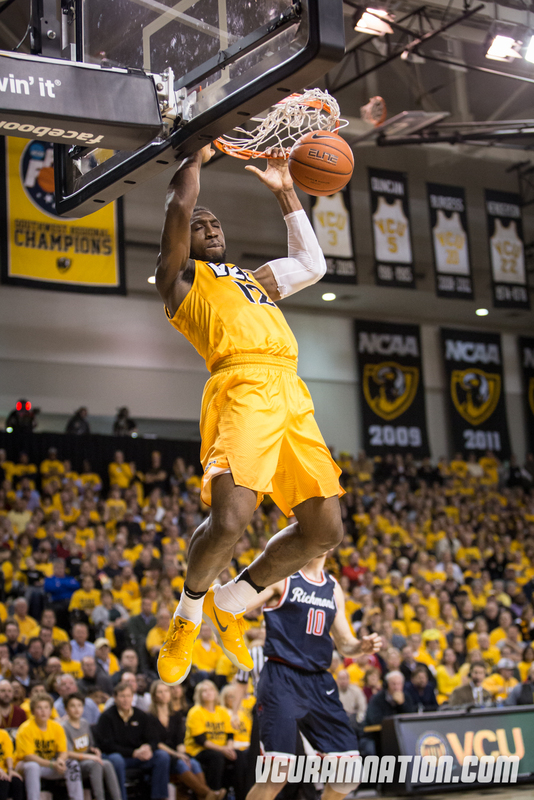 Fact is at the end of today VCU COULD be 10-2 and at the top of the Atlantic 10. But as Will Wade said earlier this season, VCU’s margins are slim and that 10-2 record might be a lot more impressive than VCU has played. Of VCU’s last seven games, only one was by double-digits, albeit an impressive blowout of a good La Salle team. Three of VCU’s last seven games have come down to the final second. The Rams lost to Fordham on a buzzer-beater, then appeared to lose to both St. Bonaventure and GW before pulling off back-to-back miracle wins to move to their current 9-2 record. The wins are all that matters, but VCU has been living dangerously close to the edge and if they want to avoid a late season collapse, need to elevate their level of play. In order to reach their full potential I think VCU will need to get some threes to fall. Question is: do they have the players to do it currently? The Rams have shot under 32% in all of their last four contests, making this VCU offense terribly predictable and one easy to game plan against (hint: pack the paint…which is how Fordham beat VCU and GW nearly did). The return of De’Riante Jenkins (44.4% from three before breaking his foot) should help there, but that’s four, maybe five games away and does VCU no favors today. Getting JeQuan Lewis back on track from distance could certainly help. The Senior came into the A-10 shooting over 40% from long range but has hit just 33% of his A-10 threes, taking a team-high 66 in conference play. VCU’s highest volume A-10 three-point shooters (Lewis, Doughty, Brooks) have all shot under 34% from three in conference play, combining to go 44-134 (32.8%). Getting any bit of consistency from deep could take VCU from good to great and would make them the favorite to win the regular season conference crown. If VCU can get paint ball going above 50%, they likely win this game. That’s soooo much easier said than done, however. The Wildcats have held their last five opponents under 50% inside the arc and all but two of their A-10 opponents this season posted sub 50% two-point shooting against them. As I’ve mentioned, the Rams have struggled when they can’t get inside scoring, so Davidson’s defensive style is a serious problem for VCU today. If the threes fall, these guys are tough to beat. Like I said, their defense matches up well with the Rams, so if this high-volume but often inaccurate three-point shooting team sees them fall, VCU’s run of luck might just run out during what’s been a very fun five-game winning streak. Kenpom: 74-66 VCU win with a 77% chance of a Rams victory.